One of the most exciting new phones announced for the beginning of 2014 has to be Samsung Galaxy S5. Its famous predecessor was one of the most talked about phones of the last year, and has managed to tower over competition, even converting a number of fervent Apple fans. While S4 managed to hold its own for quite a while, people are impatiently waiting for the new offering from the Korean giant. As is usually the case, the internet is buzzing with guesses and rumors, but there are not too many known facts and well founded educated guesses on the subject. We tried to round up the most reliable and/or interesting info on the new Samsung’s flagship and even though you might have to take some of it with a grain of salt, chances are that most of the mentioned features will be present in the up and coming Samsung Galaxy S5. One of the rumors that have still not been confirmed addresses the biggest issue that the majority of users had with the S5’s predecessor. Namely, S4, just like S3 before it, had a plastic body that just doesn’t look quite stylish or robust as those of their competition. The new S5 is expected to come in an aluminum body, and show the consumers that the manufacturer is listening to them. Naturally, some people loved the fact that the plastic body of the S3 and S4 allowed for easy battery replacement, but they can still hope that the rumor is not true. What we do know about the phone is that it will be released sometime during March of April, that it won’t boast the beloved AMOLED display technology, but that it may come with a LTPS LCD display, which might be made by Sharp, as Samsung recently bought a 3% stake in the company. The phone is also expected to come with a 64 bit processor, since it was suggested by some prominent people in the company that Samsung’s 2014 phones will be boasting such processors, however S5 was not explicitly mentioned. The company recently started production of 3GB low power DDR3 RAM chips, which are not only thin enough to help keep the phone itself thinner, they are actually expected to create a big difference in the energy consumption and hence, battery life. Again, even though it has not been confirmed that S5 will be using such a chip, chances are that it will. 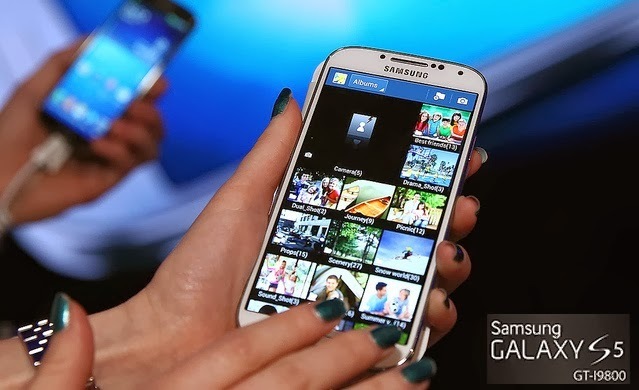 Samsung Galaxy S5 is expected to come with a modified Samsung’s TouchWiz skin for Android, and some images of it have already been leaked. There has been a lot of speculation about the screen, with some people mentioning 2560 x 1440p resolution, on a 5.25 inch screen, leading to the amazing 560 pixels per inch density. The camera is expected to sport at least a 16 MP sensor, but nothing has yet been confirmed on this. Even though a lot is still not known about the phone, expectations are high, and if even some of the things that people have been saying are true, the new S5 will definitely be an interesting phone. If you like you can just share your views by leaving your comments below. Article by Samuel Evans blogger and writer for Mobile Shop. Samuel currently exploring everything related to mobile phones.